Racing industry participants in the Central West Racing District are invited to attend the next Racing Mates Morning Tea ‘Get-Together’ to be held from 10am in the Members marquee at Mudgee Racecourse this coming Saturday (8th December). Racing Mates is a peer support initiative that was established by Racing NSW in 2016, empowering mates to look out for mates. “We’ve run many of these morning tea get-togethers previously, and it is a great opportunity for the racing community to come together for a chat,” said Racing Mates ambassador, Pat Webster. “There is nothing better than talking to someone who understands where you’re coming from,” Webster, also an accredited Racing NSW drug and alcohol mentor, said. 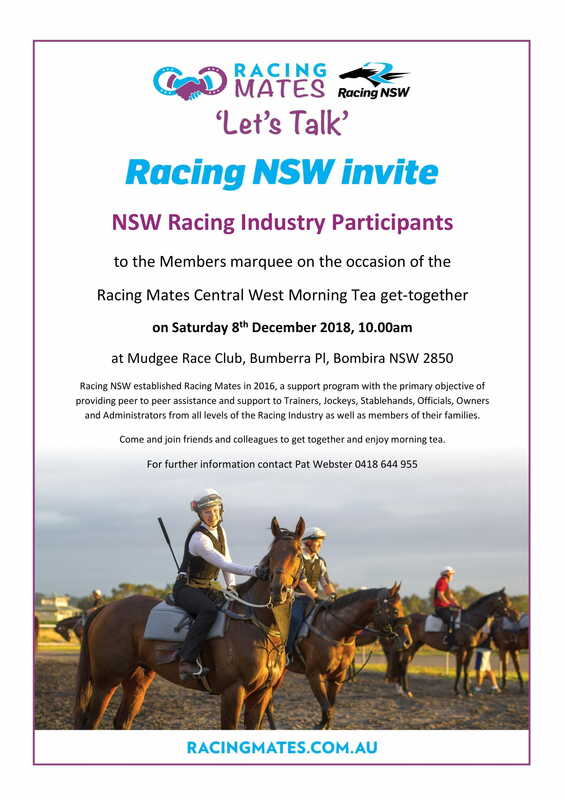 The Mudgee morning tea get-together will be held on Saturday, 8th December 2018, from 10am at the Mudgee Race Club Members marquee, Bumberra Place, Bombira NSW 2850. For further information please contact Pat Webster on 0418 644 955.